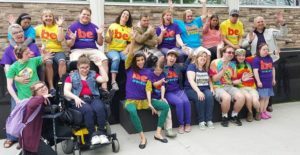 The Buddy Choir is an inclusive company who invites anyone who loves music and community to join. The only requirement is that you love to perform! The Buddy Choir performs for the public to show that everyone can shine and when we all shine together it is magic! The Buddy Choir’s hope is that life will imitate art, where all are included regardless of skin, intellect, talents or years! 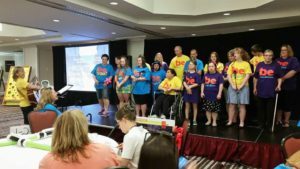 The Buddy Choir emerged through the Waterloo Region Down Syndrome Society as a choir for people with Down Syndrome and their buddies. As the Buddy Choir grew and evolved, it became a reflection of the diversity of our community and a model for community inclusion and belonging. Buddy Choir’s mission is to share art that we want life to imitate, where all are welcome. 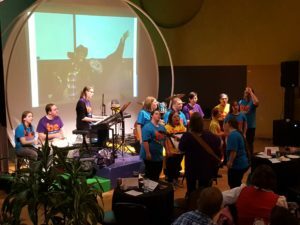 In early 2017, Bridges to Belonging was excited to enter into a partnership with the Buddy Choir as their support organization. The Buddy Choir is grateful for the ongoing financial sponsorship of the Waterloo Region Down Syndrome Society. Do you love singing and performing? Love diversity and community? Then the Buddy Choir just might be for you! We practice every Monday at 6:30 until 8:00 p.m. at Calvary United Church 91 Gruhn Ave., Kitchener. Click here to send an email to the coordinators and let them know that you would like to attend. Looking to add some excitement to your event and want the Buddy Choir to perform? We LOVE to perform! Click here to send an email to the coordinators to inquire about performances.